These margarita pint glasses are printed with an original diagram depicting the classic cocktail. Attorney-turned-artist Alyson Thomas' original artwork on these festive margarita glasses means that the formula for the tart, tequila-based favorite is always at hand. 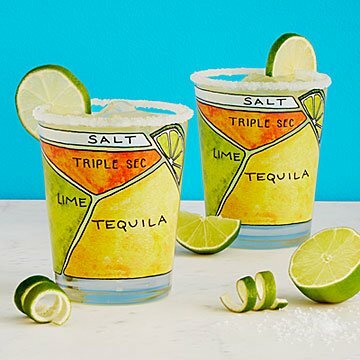 Her hand-drawn, graphic representation of the classic cocktail adorns the functional glasses with a playfully pseudo-scientific rendering of the drink's essential components: tequila, triple sec, lime juice, salt, and a lime wedge, all in relative proportions to mix a perfect margarita with intuitive flair. Glassware made in the USA. Decorated in Edina, Minnesota. Check out Alyson Thomas's other Cocktail Diagram Glasses: Martini Diagram Glassware, Scotch & Soda Diagram Glassware, Vodka Tonic Diagram Glassware, Gin and Tonic Diagram Glassware, Mojito Diagram Glassware, Mimosa Diagram Glassware, and Hot Toddy Diagram Glassware. Copyright (c) 2015 - Margarita Diagram Glassware artwork owned by Alyson Thomas and licensed to Uncommon Goods LLC. All rights reserved. I love all the painted glasses from this artist and have purchased them for gifts but have yet to buy them for myself. I plan on doing that in the near future. The Bloody Mary glasses are my favorite! Great addition to bar area. These glasses are perfect and perfectly unusual and made a great prize in the ugly sweater contest at our annual Holiday party. These glasses are perfect if you don't like the traditional curvy margarita glass shape, like us. They are a great size, too, just right for a homemade margarita. No one can pass up commenting on them! Bought these for my sister's birthday because a margarita is her go to drink. Such a unique and thoughtful design made these glasses the perfect choice! My sister loves them! The product was gift but we did use it with a bottle of tequila. Fun way to enjoy a yummy drink!